Program Notes, a text editor with mouse input, is an exceptional contribution from such a young student. This screenshot shows it in action. The mouse pointer indicates where your typed text will appear and you will see the flashing cursor once you have typed a character. Take care not to move the mouse when typing! You can select an existing block of text with a mouse click. A flashing cursor at the end of the selected text will confirm the selection. The application has an animated control bar, shown here just prior to clicking on the save icon. The bar slides down when the mouse pointer is near the top of the window or when you press CTRL+T. You receive the same confirmation if you save using CTRL+S. 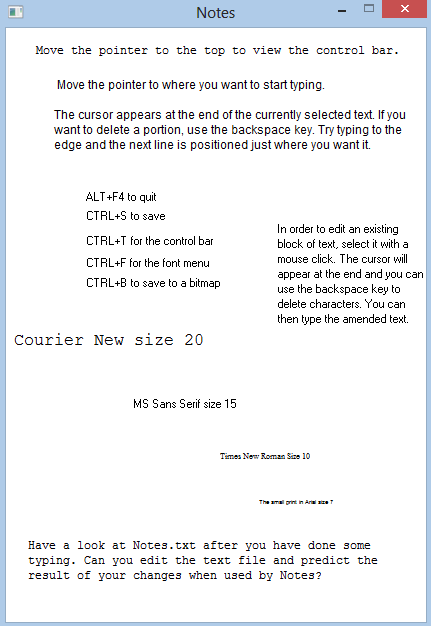 Key combination CTRL+F gives you the font menu and CTRL+B is the short cut to obtain the dialogue for saving as a bitmap. See the menus and dialogue below. (last but not least) thorough and appropriate comments. Remarkably, young James learned advanced techniques by himself (using mainly PPS material and the WinGraph documentation) and overcame difficult problems unaided. Scan through the thorough comments in the code below to see great attention to detail resulting from the considerable amount of thought that he has invested in this application. James intends to develop Notes further so we look forward to publishing any enhancements. You can download notes.zip containing Notes.exe, Notes.pas, the starting Notes.txt (and our NotesPPS.txt which you could rename to Notes.txt) that must be in the same directory as the executable. If you want to develop the code or experiment with it, you also need wingraph.pas, wincrt.pas and winmouse.pas which you download in a zip file from this documentation page. SHOW_INFO = False; //Set to true to show general info about record items. CourierNewFont: Str := 'CourierNewFont';   //so changes to it during runtime will be saved. //Write necessary info to the file in a way that is readable by the program. begin  //Draw 'Saved Notes.txt' that drops down from the top. DefaultFontSize := StrToInt(Str); //Read and set the default font size. for Count := 0 to numoftexts - 1 do  //Draw information about text items. if (FontPanelTab = FontTab) then  //This is the code for the font section of the font panel. case User_Font of   //Draw the bar to show the selected font. case MouseY of  //Draw the bar to show what the mouse is hovering over. 191..220: User_Font := MSSansSerifFont; //set the font to that font. begin      //This is the code for the font size section of the font panel. case MouseY of //Draw bars to show what the mouse is hovering over. LastPanelCalled := None; //Make sure the program will exit the panel. end;                            //keep the panel running after all. setfillstyle(solidfill, Gray);        //Draw the control bar coming down. begin  //Draw the control bar going up by drawing a growing white bar below it. case MouseX of //Draw bars to show what the mouse is hovering over. begin               //Do actions according to which icon is clicked on. if not CloseGraphRequest then //Turn the dialog red if the user tries to close the window. MouseX := GetMouseX;              //Check if the user wants to overwrite. Rewrite(BMP_File, 1);                   //it is dealt with later on in the code. if IOResult <> 0 then //If IOResult isn't equal to 0 then it means an error has occurred. Exit;    //Exit the procedure after the user clicks ok.
GetMem(BMP_Memory_Location, BMP_Size);     //the program saves the bitmap. end;                                                                   //increment the number of characters to be displayed. Dec(CharsToDisplay);                                         //decrement the number of characters to display. FileAddress := leftstr(FileAddress, length(FileAddress) - 1);//character off the end of the file address. sleep(100); //mouse button is pressed, the mouse button will have been released. if ((MouseXAsOfLastTextEntry <> mousex) or   //breaking it onto a new line if necessary. Inc(numoftexts);                     //Create a new text item if one is not being edited. Text := Text + inputkey; //Add the character to the text item being edited. CurrentStringPos := length(Text);  //in the text, and break what is after it on to a new line. //The font size is the height of the text in pixels. //only backspace if mousexasoflasttextentry= mouse x and same for y.
if inputkey = #19 then //#19 is Ctrl+S. This is the code for saving. //Reorder items to make the text clicked on the latest one, so that the rest of the program will edit it. //A linked text is one that is created as the result of the program breaking text on to a new line. ((Texts[numoftexts - 1].Y + Texts[numoftexts - 1].Fontsize) >= MouseY)) then //it cannot be linked to any, so make the program edit it. //number of texts that are in the 'chain' of related texts. Texts[NumOfTexts - 1] := Texts[Count];    //to the new free space. repeat  //Move all the texts numbered higher than the original position of the texts backwards into the available spaces. MouseYAsOfLastTextEntry := MouseY;//Delete the available spaces at the end that were created by the previous step. begin                  //because no key pressed is #1 in this program.